Welcome to the wild safari! 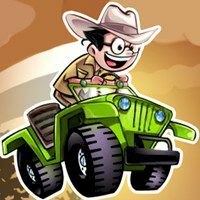 In this game you will drive your cool truck and at the same time you must answer different questions. You can answer only yes, or no. everything is up to you. Just control your car and drive as long as possible. Good luck to you! Are you a good driver? Well, then be sure that this game is for you! Cause here you will face question while driving and you can answer those questions by following the direction road signs. So, everything is up to you! If you take the right lane, you score points but if you take the wrong lane, anything can happen. It is so easy to control, just use up arrow to accelarate, left and right arrow to steer, and down arrow to brake. Could you believe that? So, just sink into the wild safari and enjoy the game! Ready, then go!